These two parties have actually gleaned 227 seats of the 395-seat House of Representatives, leaving the other contenders far behind. After the PJD with 125 seats and the PAM with 102 seats, the Istiqlal Party came in 3rd after it won 46 seats. It was followed by the National Rally of Independents (RNI) with 37 seats, the Popular Movement (PM/27), the Socialist union of Popular Forces (USFP/20), the Constitutional Union (UC/19) and the Party for Progress and Socialism (PPS/12). This bi-polarity that is so damaging to the other contenders emerged, maybe, because of the low turnout that stood at only 43% of the some 16 million registered voters. 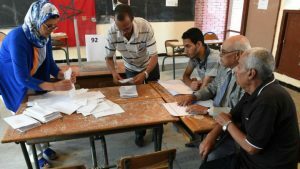 The majority of voters stayed away of the polls, leaving room for the disciplined supporters of the PJD to score points and propel their party to the top rank, despite the general frustration triggered by its economic policy, anti-social actions and conservative stances. Some analysts explained that the results are not surprizing as they are consistent with the outcome of the communal and regional elections held on September 4 last year. Besides, they said, in these elections, the issue was not about the achievements of the Benkirane-led Government during the past five years, but rather a confrontation between two ideologies, the PJD’s conservatism and the PAM’s liberalism and modernism. After the results of the Friday polls, the PJD will lead the coming Government for another five years, as stipulated in the 2011 Constitution, but it will not be alone onboard as under Morocco’s electoral system, no party can win an outright majority in the 395-seat parliament. Therefore the leading party needs to unite with other parties to form a coalition government. But what is most important is that the Friday polls, hailed by Moroccan political stakeholders and international observers as transparent, honest and free, have confirmed that the Moroccan experience is so exceptional in a regional environment marked by uncertainty and instability. They also confirmed that Morocco’s democratic process is steadily moving ahead, under the leadership of the country’s ruler, King Mohammed VI.